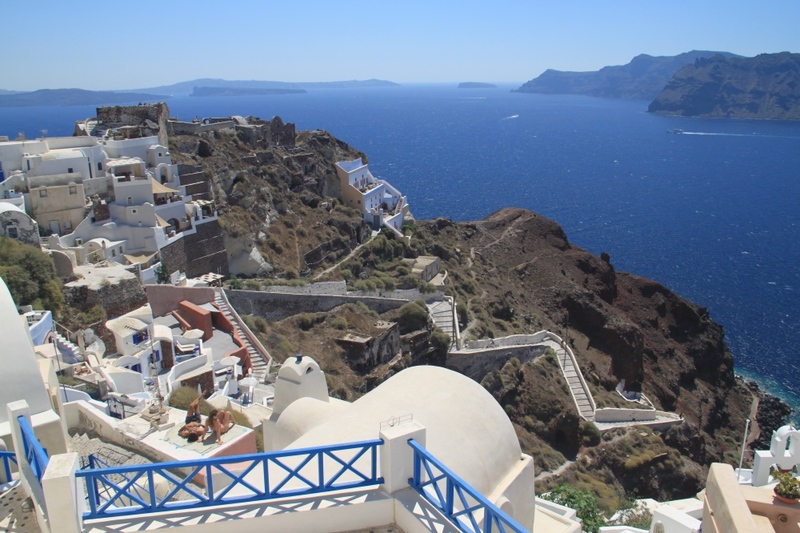 A few years ago, we were lucky enough to visit the beautiful island of Santorini. 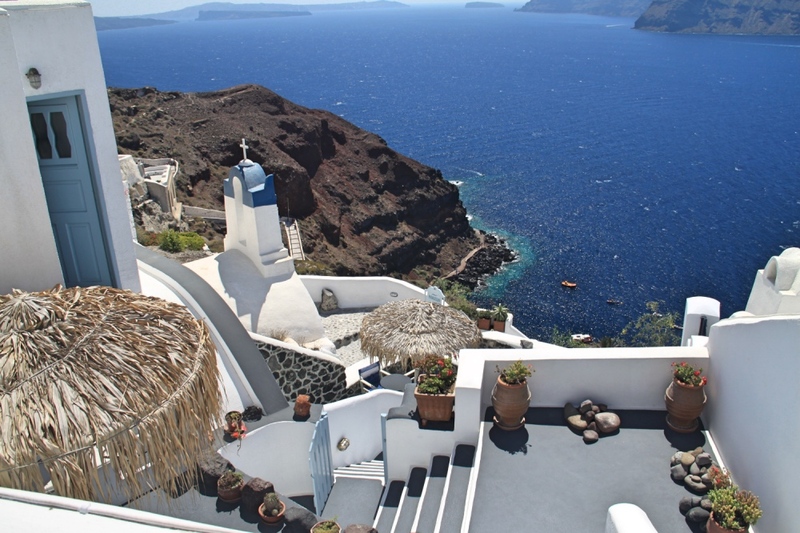 Located in the Cyclades Islands in the South of the Aegean Sea, Santorini is one of Greece’s top tourist destinations. It’s also one of the most romantic islands in the world and one of the most photographed. With its white-washed villages, blue-domed churches, multicoloured cliffs and dramatic views over the caldera, Santorini really is a photographer’s paradise. A view out over Oia. 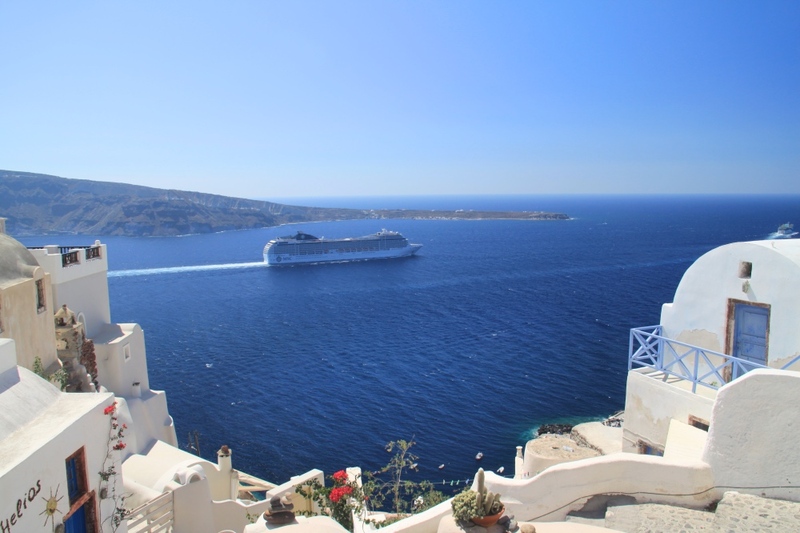 Whether it’s the blue-domed churches, the blue doors on its white-washed homes, its gorgeous blue sky or the beautiful blue sea that surrounds it, Santorini offers more shades of blue than anywhere else on earth. 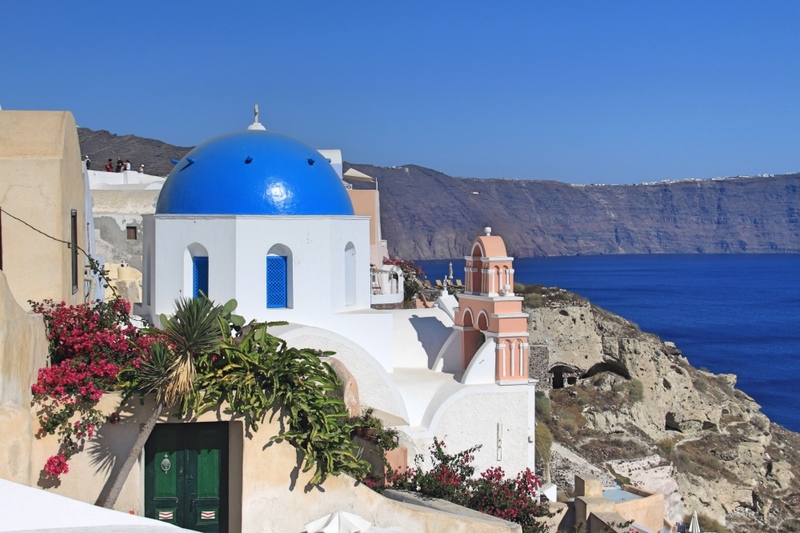 A blue-domed church in Oia looks out over the caldera. 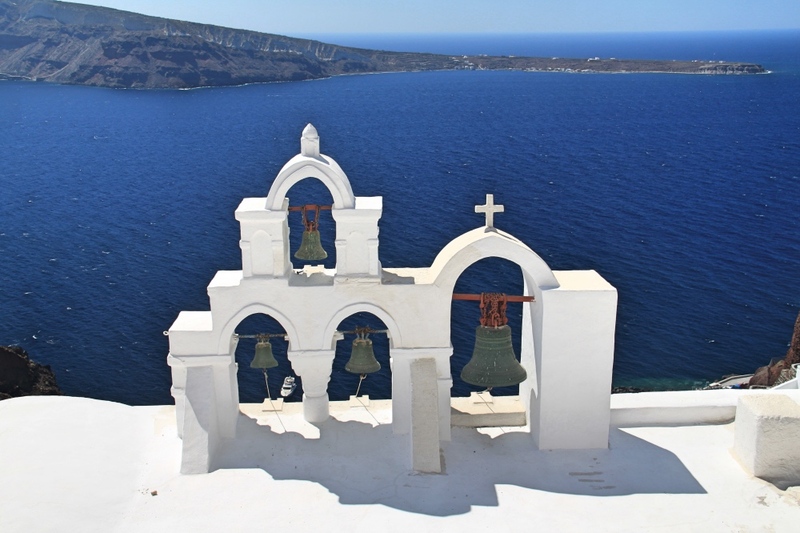 White church bells set against the deep blue caldera. Just beautiful! 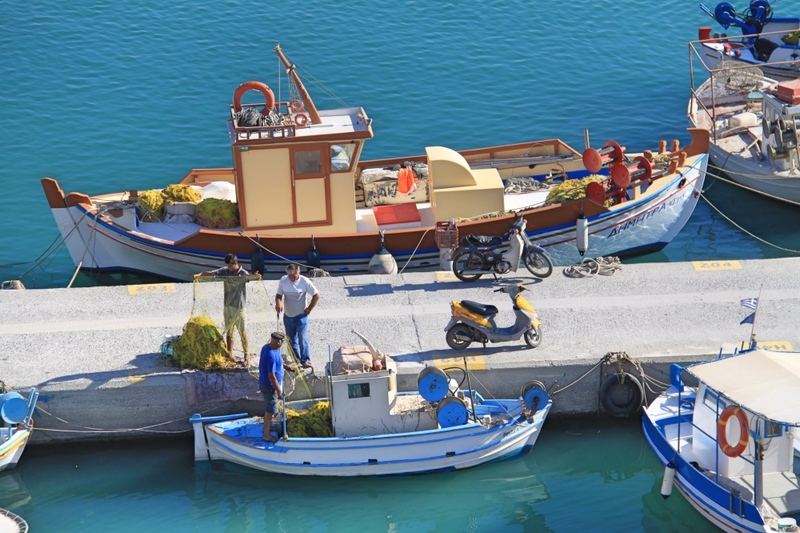 Fishermen at work in Oia’s harbour. 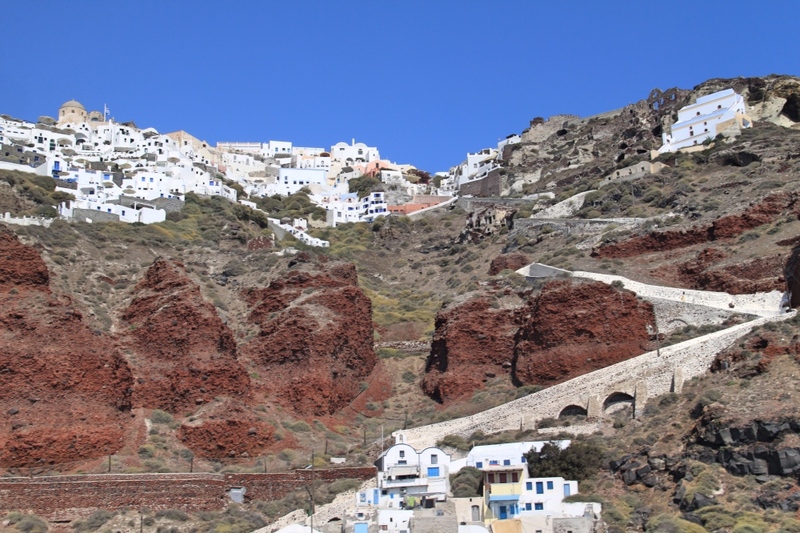 These magnificent white-washed buildings built at the top of the volcanic cliffs are spectacular to see in person and give Santorini its iconic architectural style. You will also find many houses built into caves and you can even stay in one! Many of them have been turned into hotels or holiday accommodation. We stayed at the Marizan Caves in Oia, which we highly recommend. 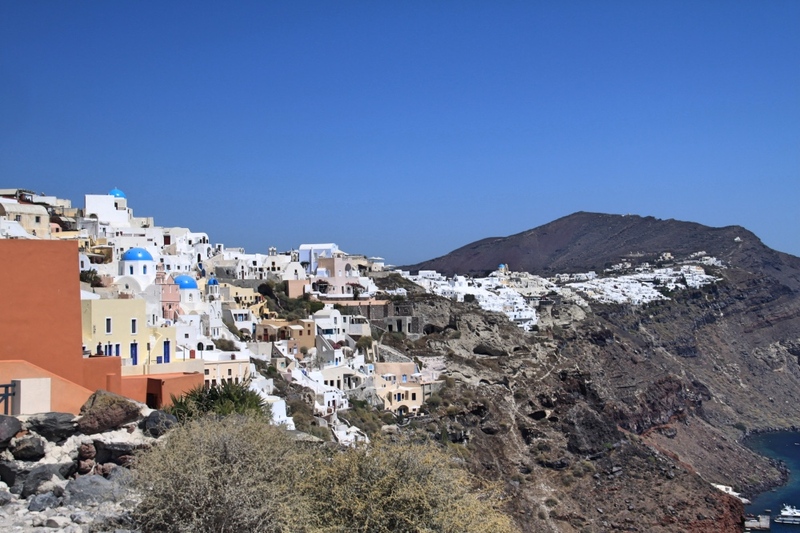 The old village of Oia hugging the cliff top. 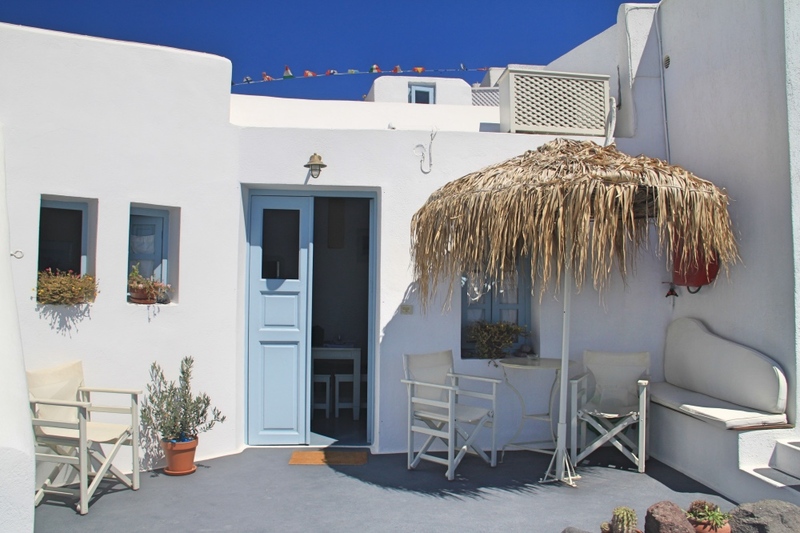 Our cave house in Oia! Oia perched on the top of the cliffs. The views from all over the island are just incredible and there isn’t one place where your jaw won’t drop as you try and comprehend the beauty of it all. The best thing to do in Santorini is to just sit on one of the many terraces, enjoying a gorgeous Greek meal or a glass of Santorini wine and gaze out at the breathtaking views over the caldera. 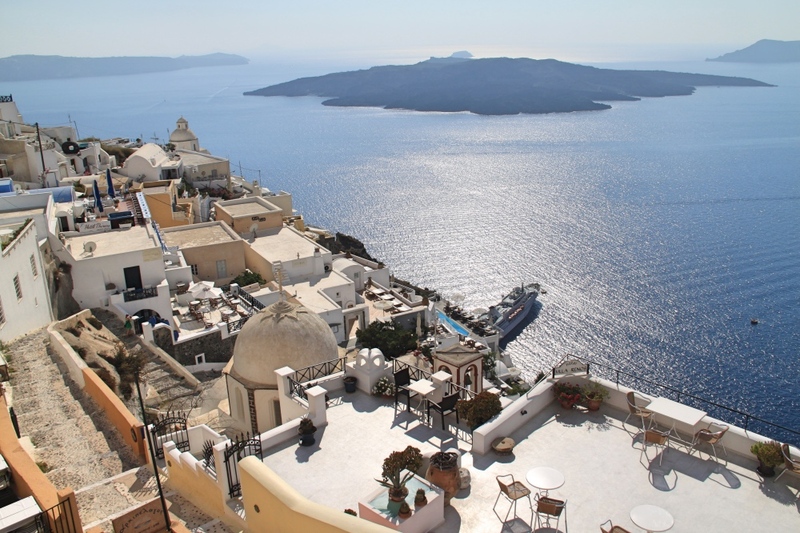 The incredible view from one of Oia’s many restaurants. The amazing view from our cave at Marizan Caves. 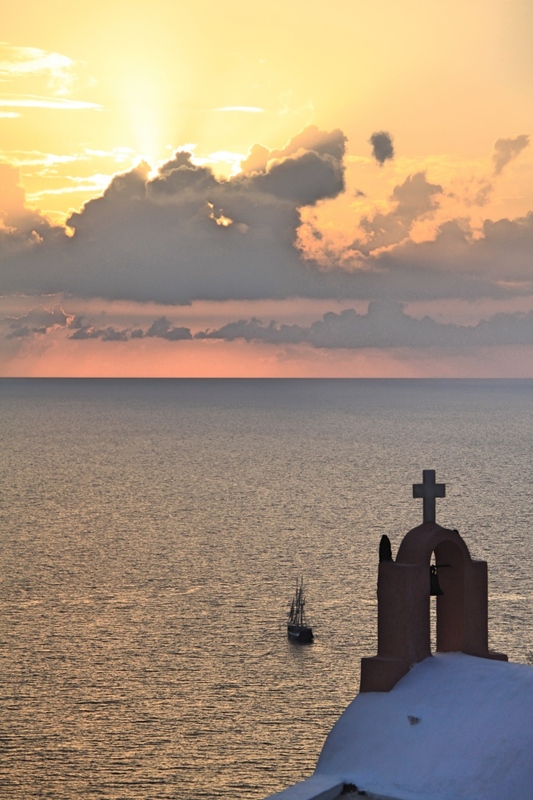 Santorini has the most famous sunsets in the world. 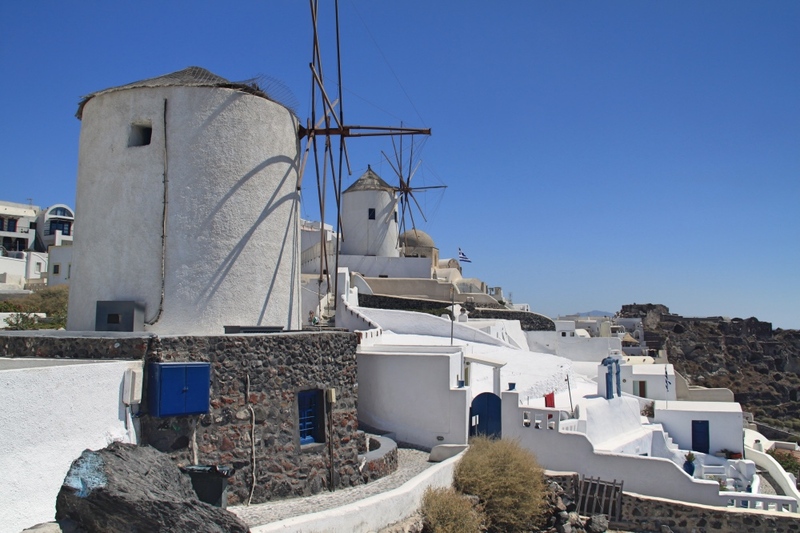 You will find them in the small white-washed village of Oia in the north of the Island. It gets crazy popular there so be prepared to arrive very early to grab a good spot, or follow our lead and rent a cave room at Marizan Caves. You’ll get the sunset every night from your balcony without having to try and beat the crowds. Just spectacular! 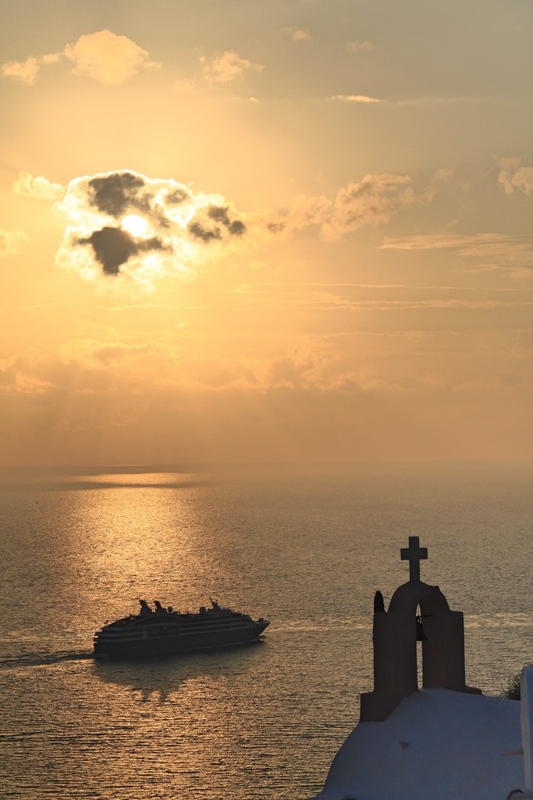 The sun setting over Santorini. The most famous sunset in the world. Can’t get tired of this. 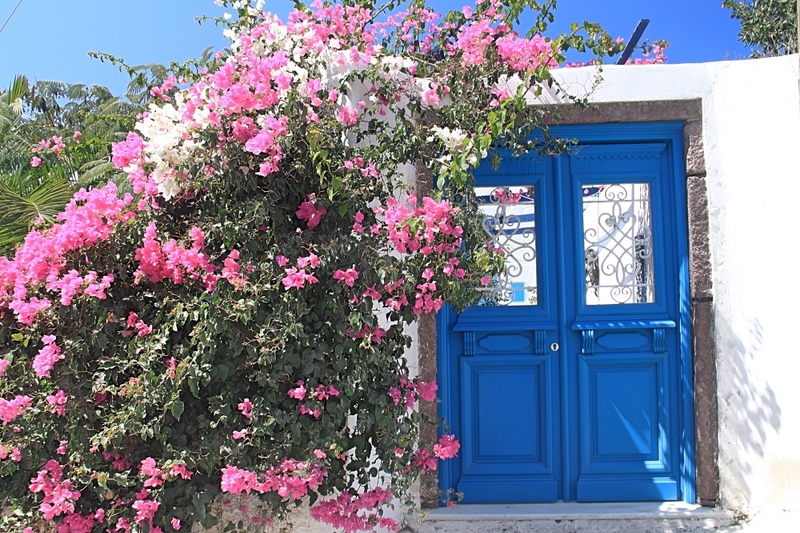 A lot of Santorini’s charm comes from its many flowers growing up and along the walkways and walls of houses. Santorini’s landscape is dotted with splashes of colourful Geranium and Bougainvillea flowers. Their beautiful colours contrast wonderfully with the white-washed buildings and the endless deep blue of the skies and the sea. 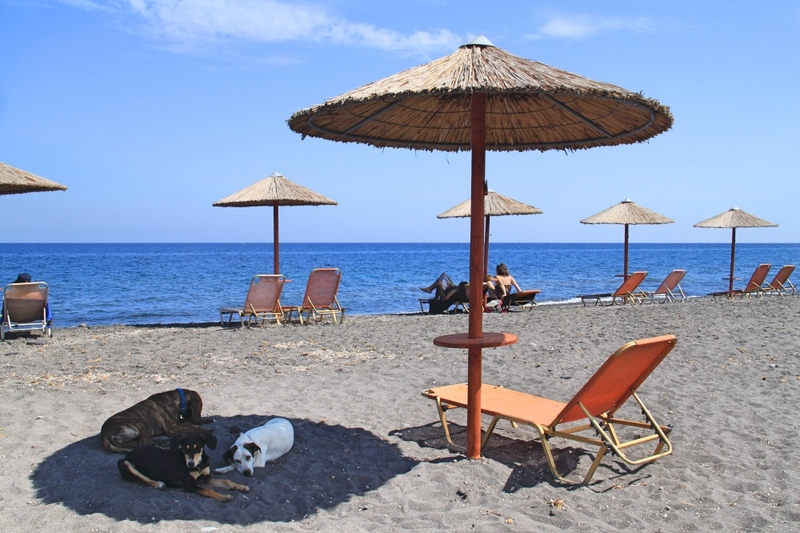 6- The world famous and highly photogenic dogs of Santorini! 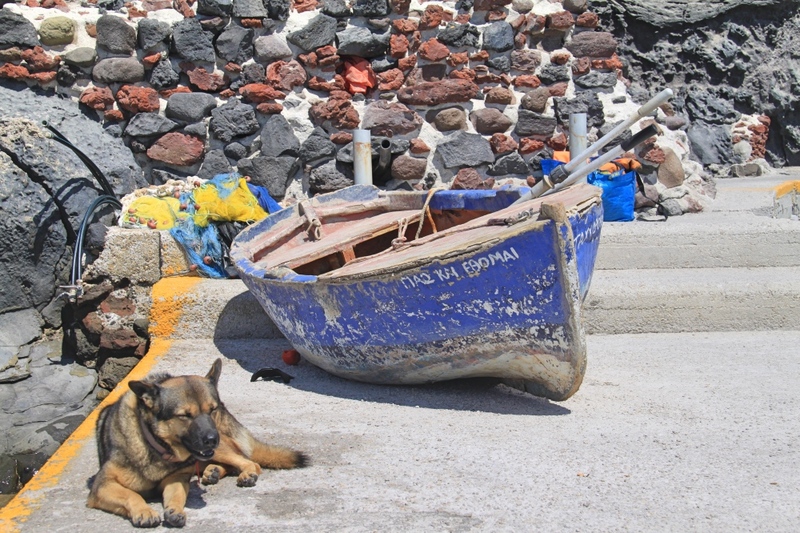 Yes the dogs of Santorini are famous! They have a great life and they are the most photographed stray dogs in the world! The locals take really good care of them so they mostly look really healthy and they certainly are cheeky! They love posing for the camera as you can see! In the evenings you’ll often find one passed out next to the table in your restaurant as you eat your meal! Just chillin’ by the port! It’s a hard life being a Santorini dog! 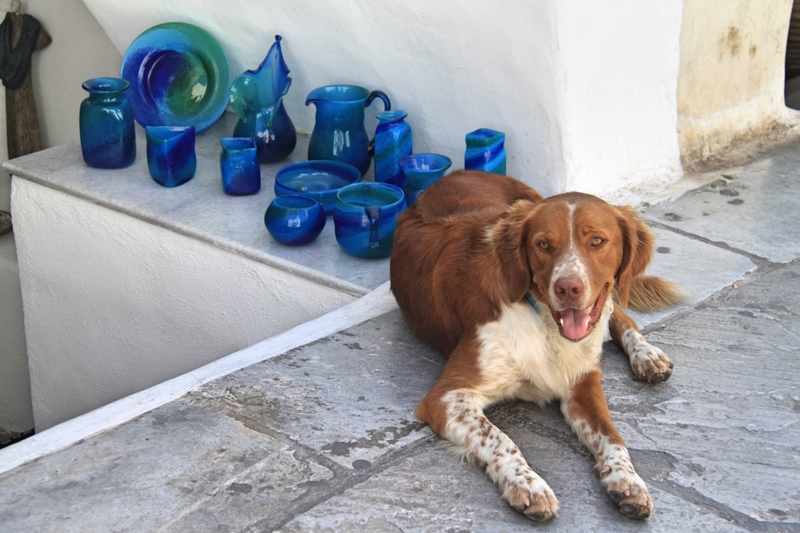 A Santorini dog turned into shop keeper! 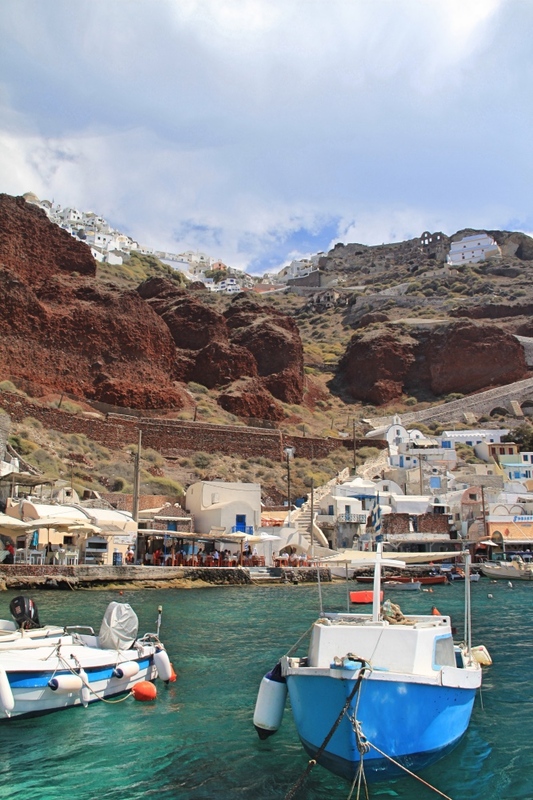 In Santorini, you can take a short boat trip to the nearby active volcano. There are many photo opportunities as you hike up to the summit and walk around the edge of the smouldering crater. 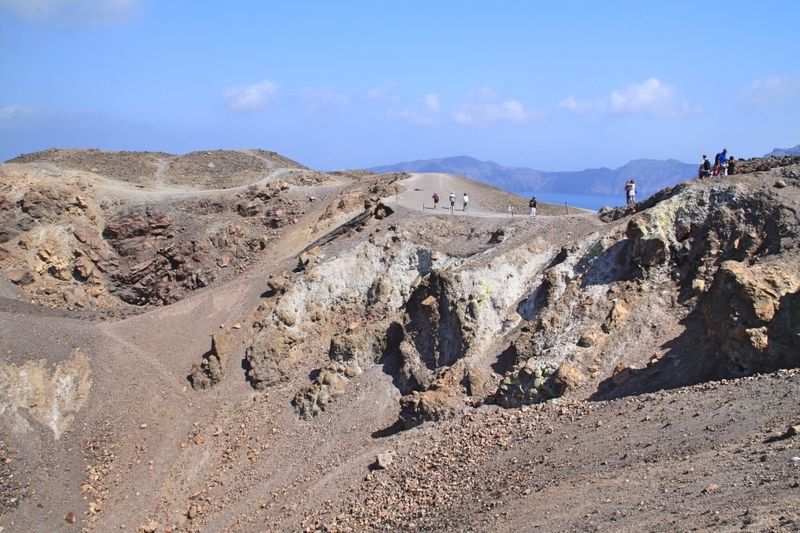 You will also get some fabulous views over the caldera from the top of the volcano. Walking up to the summit of the volcano. 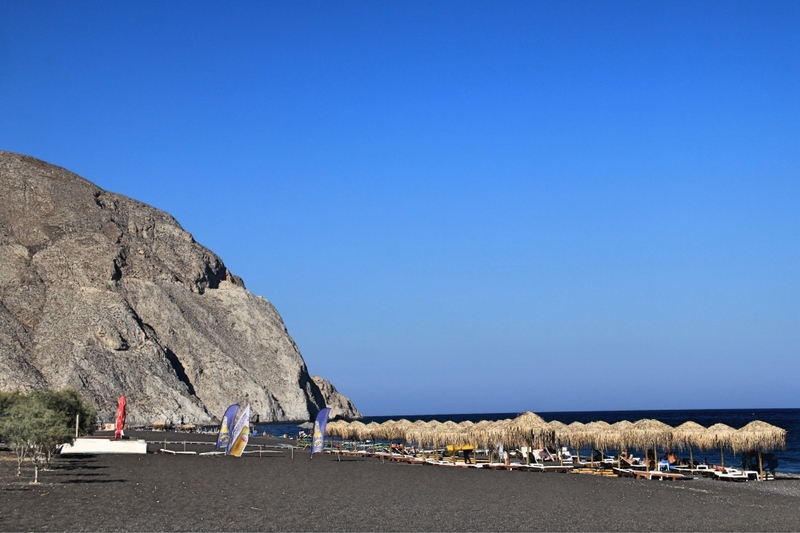 The beaches in Santorini are quite different from the beaches in other parts of Greece. This is because they are volcanic. Their shores are made from red and black volcanic pebbles and they are hemmed in by steep and rugged cliffs. 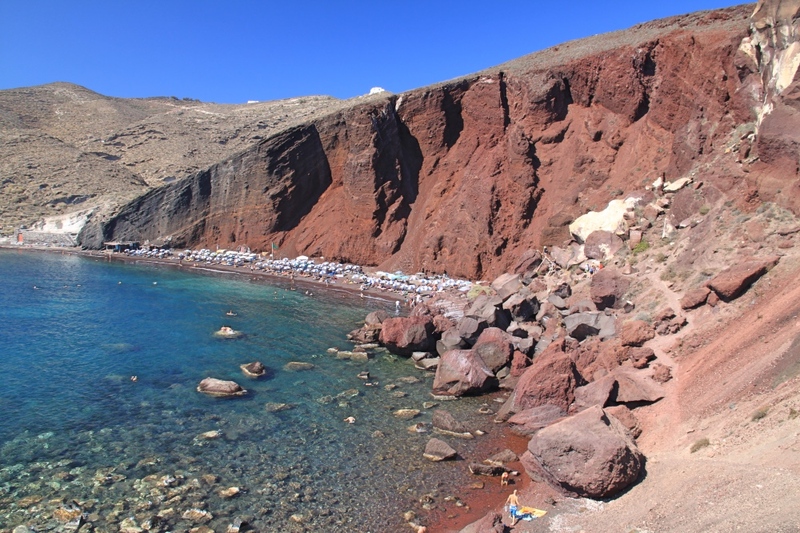 The most famous beach of Santorini is the Red beach in the south of the island. With its red sand and warm water it is also one of the most popular beaches on the island. It’s a bit of a climb down to get to it but it’s definitely worth it. 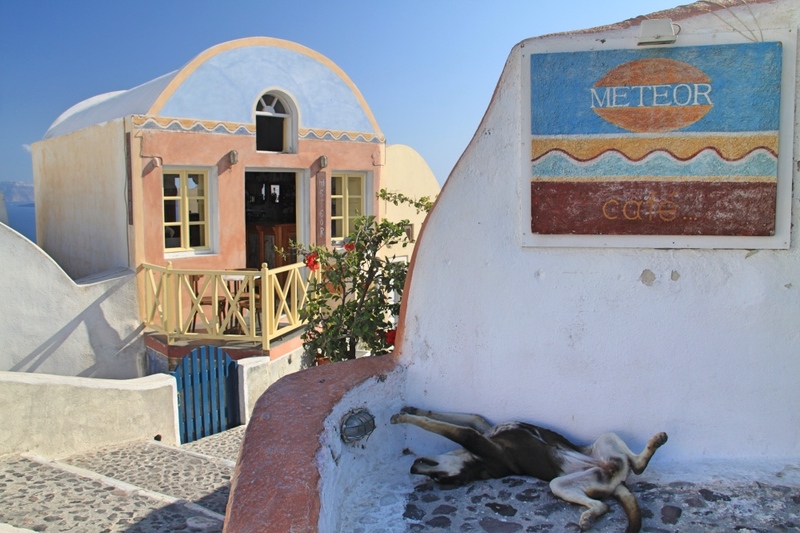 Santorini is full of beautiful villages that are worth exploring and photographing. There are so many to choose from. 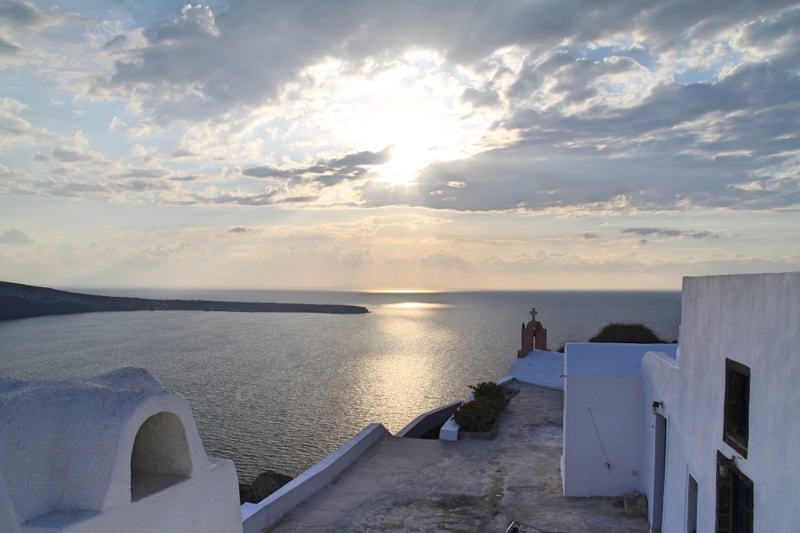 Our favourites were Oia, Imerovigli, Megalochori, and Ammoudi; but no matter where you end up you will need a spare camera battery! 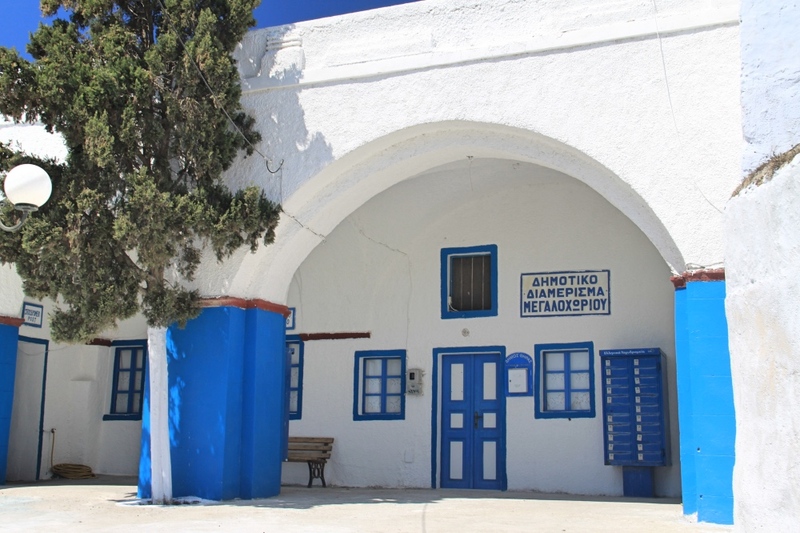 The old port of Ammoudi. Oia perched on the cliff top with the old port of Ammoudi down below. A visit to the port. 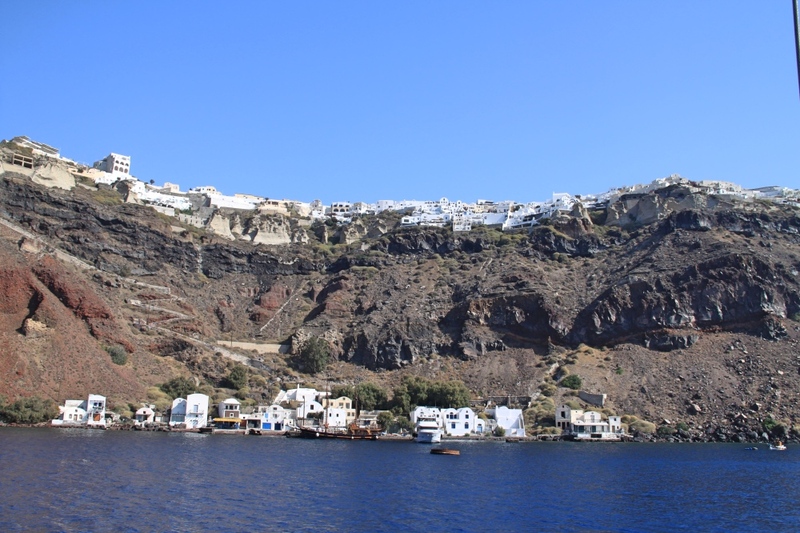 For beautiful views of Santorini from sea level make sure to hop on one of the many boat trips that you can take from the island. Whether it’s a sunset cruise, a trip to the nearby volcano or a private caldera tour, you wont be disappointed with the views from the water. Another great way to appreciate the island from the sea is to arrive by boat. It is the cheapest way to get to the island and the most breathtaking. It takes a lot longer than by plane but if you are not in a hurry it’s a great option. An incredible view of Oia and Ammoudi taken on our cruise to the volcano. Are you convinced yet? 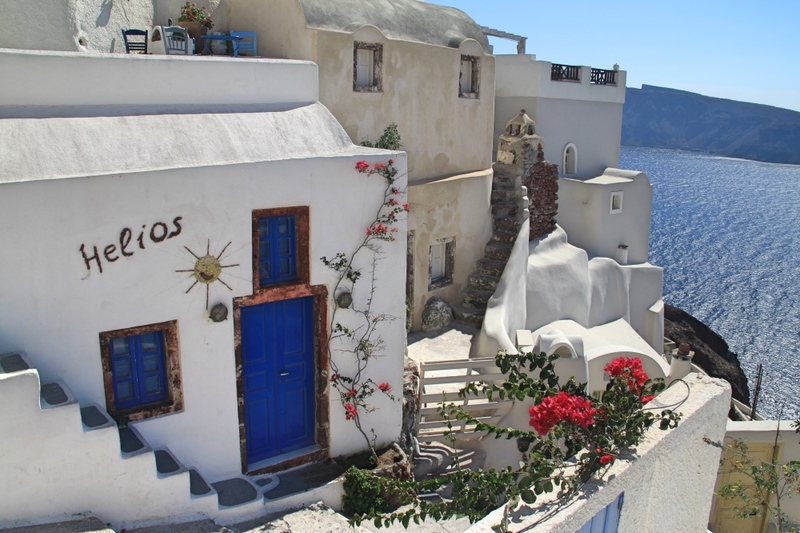 Is there anything as exhilarating, breathtaking, and idyllic to look at than the white-washed houses and streets of Santorini? We don’t think so. 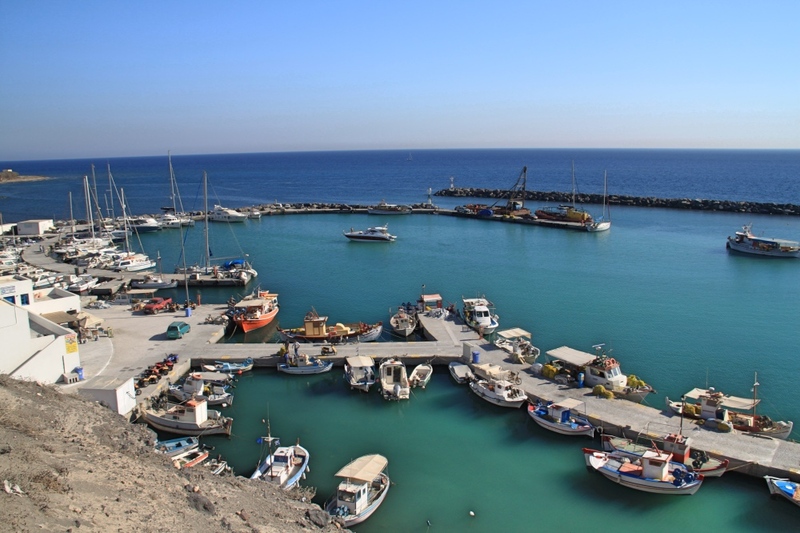 Of course, no photos will ever do Santorini justice so make sure you go and see it with your own eyes. 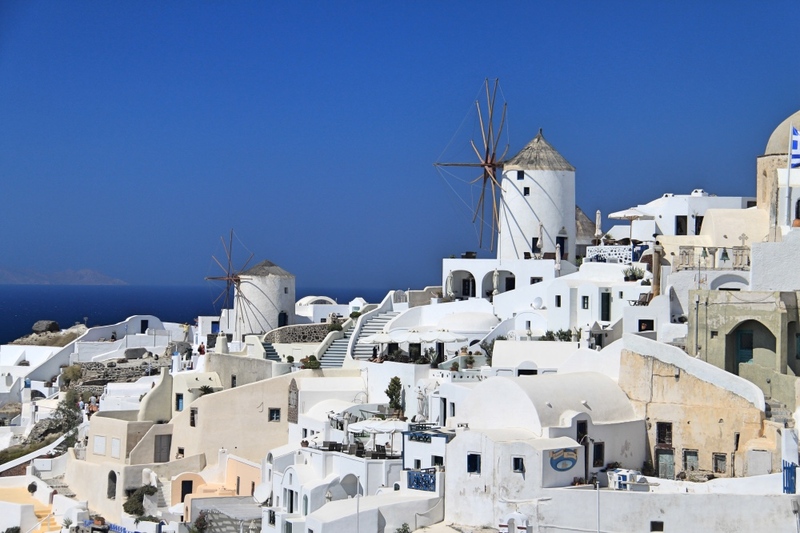 There are not many places in the world that will captivate you the way that Santorini does. 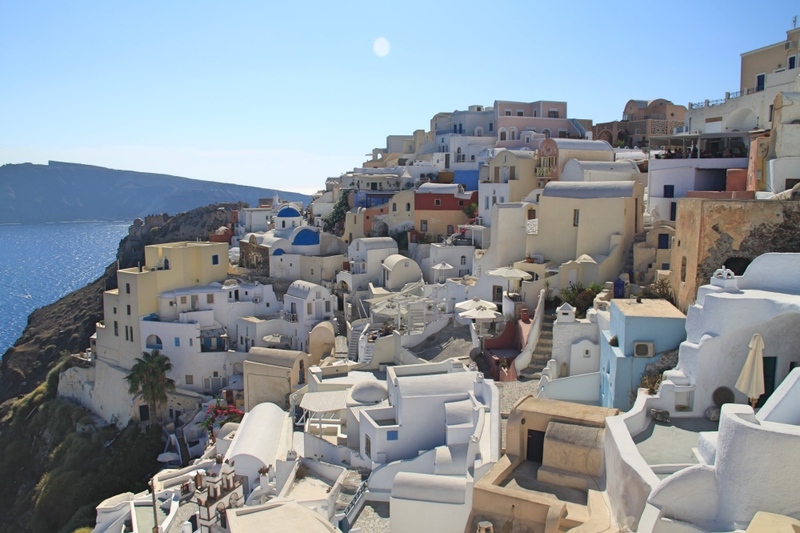 Santorini is one of our favourite places in the world and we are longing to make a return trip. What we regretted the most was not staying long enough. Although we spent four days there we could have easily spent four months without tiring of its views. So whether or not you are a photographer, make sure you pay Santorini a visit. You won’t be disappointed. I wonder if the weather in Santorini is always this beautiful. Santorini is on my bucket list and the main reason iw photography. It is picture perfect indeed! Incredible photos – thanks for the tip on a cave room at Marizan Caves – that’s actually what I was going to ask, re tips for getting photos of the sunset without having to deal with ridiculous crowds. Love that you can snap away from your own private balcony – sounds like the way to go! Hi Megan, yes the Marizan Caves was perfect for the sunset. It was pretty much at the tip of the island and the sunset view was the best. It was so nice not to have to fight for the best spot a hundred meter down the road! 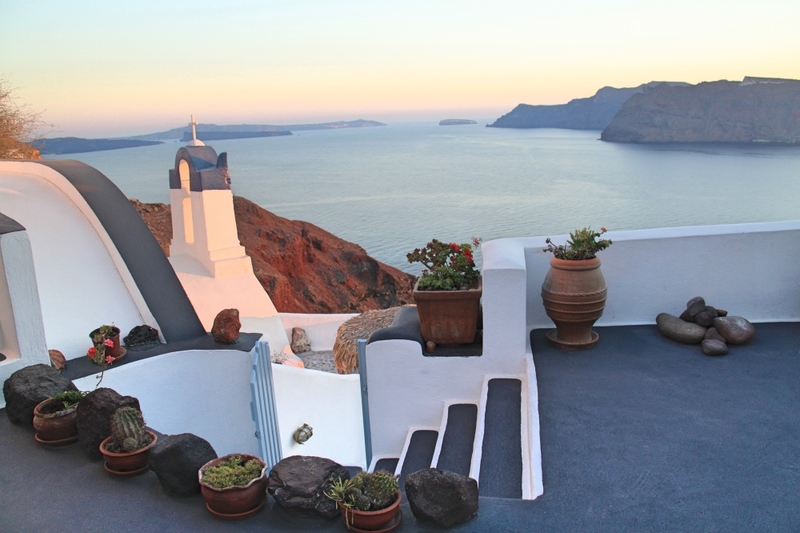 So much quieter and we could enjoy a nice glass of Santorini wine on our balcony while watching the sunset. Perfect! Thank you very much Chloe, glad you enjoyed the pictures. Santorini has been on my travel list since a long time. I am mesmerized by both it’s natural as well as man made beauty. Such a picturesque place is bound to be every photographer’s paradise. Santorini may just be the most photogenic place on Earth. Your amazing photos are a proof to that! The house caves with overgrown Bougainvilleas are my favorite!